Aircraft being towed to clear the landing area. You can also see that the helicopter has tie-down chains fitted. The "33" towed forward. You can see at the island's side two loudspeakers, the rectangular one was used by the air boss from the conning tower. 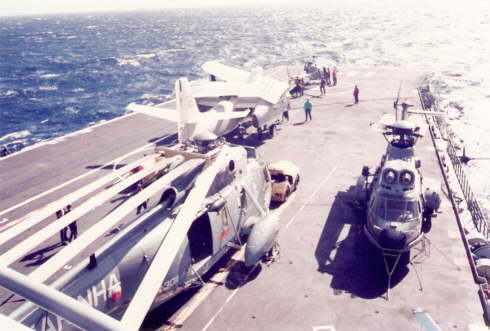 Photo from the island shows the aircraft arrangement and tie-downs on the helicopters. You can also see the catwalk with refuelling hoses heels at each end of it. 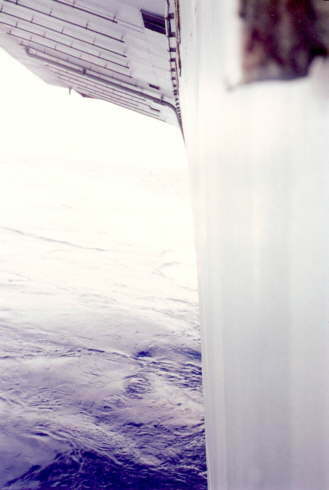 Beyond the upper heel, there was no catwalk at all, just a frame sustaining a safety net preventing the 'man overboard'. 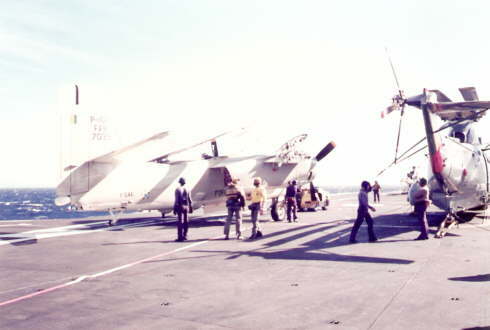 Note the painted squares in different colours at the very edge of the deck, indicating the catwalk's gadgets purpose. The "33" after the crew had boarded the plane. 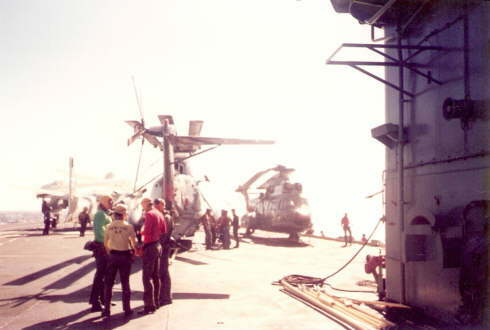 The mechanic has the access stair stowed on the plane's main access door and gives an OK to the Navy personnel. 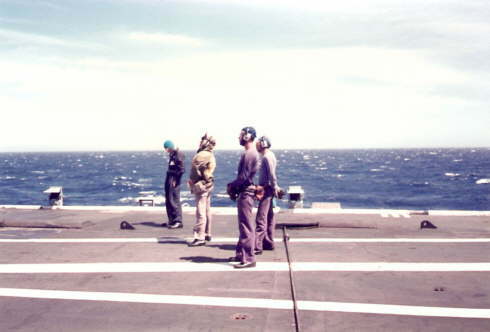 Note the LSO's wind shield and the corrugated surface of the deck noticeable by the deck white stripes trim. 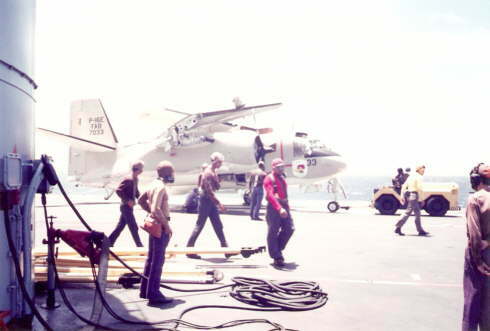 After the air boss check for loose things on deck, fire extinguisher, propellers clearance, goggles and ear protection applied, from the control tower - directed by the navy personnel, the aircraft has its engines started (see the 115 VAC cable pending from the plane's belly. 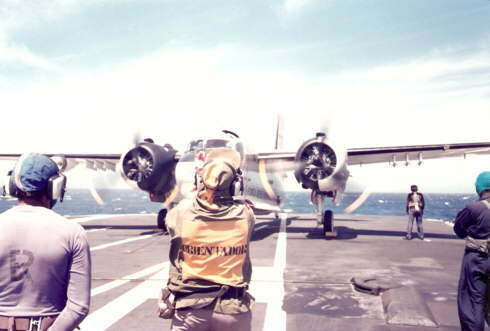 After being released by the mechanic, it was reeled and stowed by a sailor wearing blue shirt barely seen behind the plane's left main landing gear). 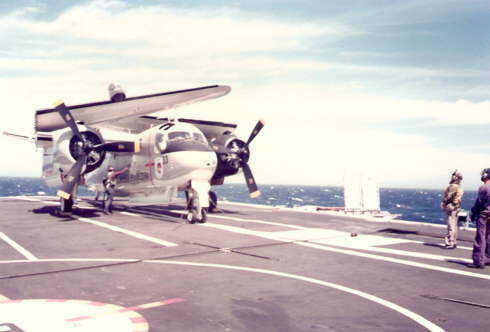 Note the plane has its torpedo bay doors open and the deck's corrugated surface by the yellow strip. 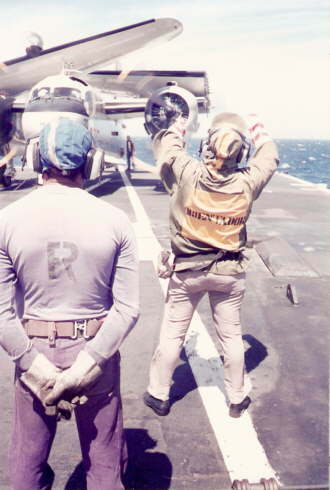 Guided by the 'orientator' as stencilled at the navy man's back, the mechanic checks the movement of the plane's control surfaces. If they match with the pilot's gauges, the checking goes on. Note the joint of the cable centre section with the left hand end section and its attachment point a little forward and a little more the precedent wire's casemate through which the cable was connected to the bumper system. 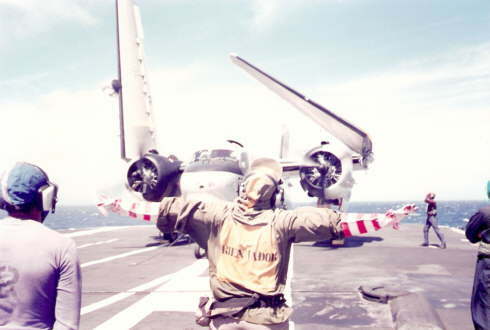 The 'orientator' spreads his arms and the pilot operates the wing spreading system. The mechanic stands for visual checking of the hydraulic operated locking system. Normally there was another guy at the right wing. The fellow at right is the waiting LSO Captain Cavalcanti. Photo shows the '33' almost flight ready, putting flaps down and the mechanic finishing the external checks. The waiting LSO, the 'orientator' and the two blue shirt guys in charge of taking the chocks and tie downs chains off before take off. A view from the island 'front yard' looking towards the Port side. The red shirt fellow is the late Lt. Cantuario, armament officer of the 1º GAE. 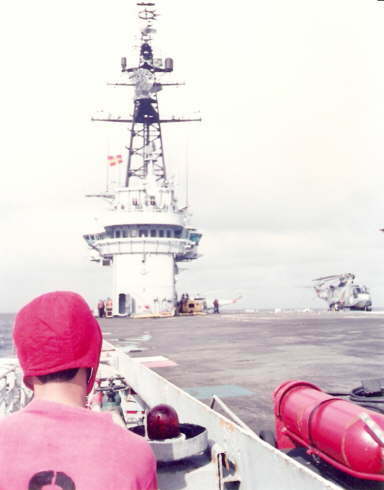 This photo was taken from the extreme of the starboard side bow catwalk. The red light are for night flight operations and it's the only thing you see of the deck at night. At the side of the fire extinguisher, there is a power cable for the aircraft engine starters. Beyond the island a Brazilian Navy's SH-3 helicopter. 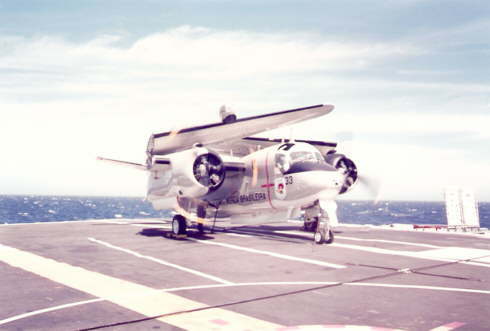 Photo taken from the 1st GAE's spares depot porthole looking aft on the starboard side and shows the huge overhang of the flight deck and the propellers wake when the ship was slow moving.